Soup. 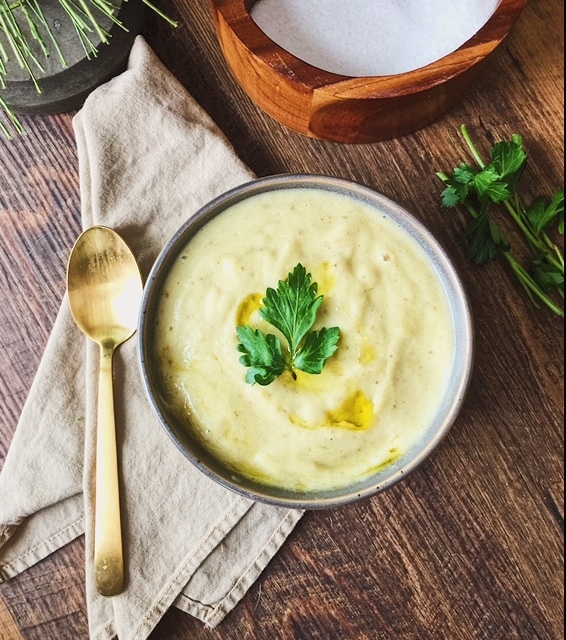 Silky, flavorful, deliciously satisfying Creamy Potato Leek soup. This one will keep you warm for hours and comes together in less than 1. Lets do it. I’ve mentioned in a previous post my love for things in bowls, especially during the winter months. I could literally eat these easy 1-pot meals on the regular and often do. I made this recipe for the first time during the month of November. Since that time, I have made it 4 others and it has been devoured almost immediately. The inspiration for this came from wanting to use my immersion blender. It sounds silly I know, but I think that thing is pretty cool. 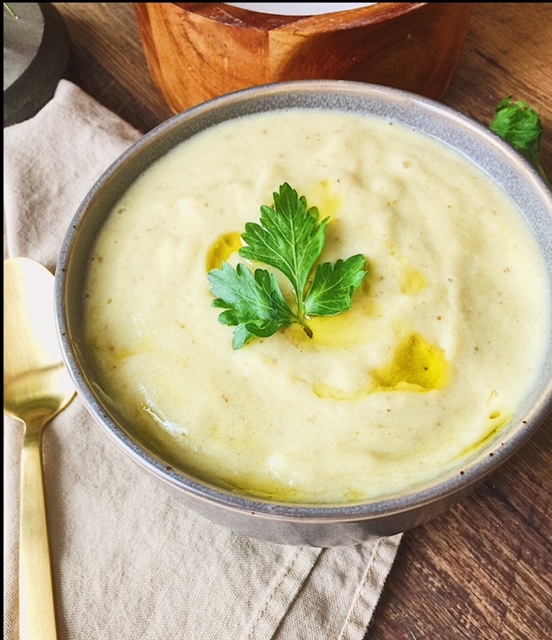 I don’t blend soups or sauces all that often because I like texture, but I wanted this to be silky and elegant feeling when we enjoyed it more so than rustic. However, if you don’t have a blender, feel free to serve this in all its glory nice and chunky for more of a chowder like meal. It’s no secret that leeks and potatoes go well together so it’s not like I came up with some brilliant food pairing. However, I had these ingredients in my fridge and decided to roll with it to see how it turned out. At one point, I tasted it and said to myself, “It’s missing something.” That’s when I added a couple heaping tablespoons of dijon mustard and that sent it over the top. Everyone go make this now. It seriously does not disappoint. As always, no dairy here but you’d think it was loaded with butter and cream. It’s basically magic. A tip about leeks– you want to use mostly the white parts. Chop the ends and then slice down the middle. Run the leeks under cold water to get out all potentially trapped sand and dirt. Leeks have many layers to them so all the crevices are places dirt can hide. We don’t want that, obviously. Start by heating a large pot and add a a bit of olive oil, the leeks and celery. Cook these on low until just translucent but not browned. The reason we do not want any browning here is because we want the soup to remain a lighter color. If we were to brown the vegetables it would significantly darken the color of the finished soup. Once the leeks and celery are translucent and soft, add the garlic and stir until just fragrant. Add everything else to the pot except the soy milk/lemon juice mixture and the dijon mustard. Cover the pot and cook until the potatoes are just tender. Measure out the soy milk and add the lemon juice. The purpose of this is to give it a “buttermilk” like flavor and consistency. The lemon will give the soy milk a nice tang while also acting as a thickening agent. Remove the bay leaves from the pot, add the soy milk and mustard. Stir to combine. Taste. Add salt to enhance the flavor. If you have an immersion blender, now is a great time to use that. If you have a normal blender, ladle the soup into the blender and blend until smooth. You may have to do this in batches depending on the size of your blender. Once smooth, pour into bowls and serve. Feel free to get crazy with the toppings. Fresh herbs, micro greens and garlic bread crumbs are all great options. Hemp seeds would work well here too. If you make this, be sure to leave a comment! Add the olive oil, leeks, and celery to the pot and sweat until translucent. Sprinkle with salt to draw out the moisture. Try not to get any color on the vegetables. Once those are cooked, add the garlic. Sweat the garlic for 30 seconds just until fragrant. Add the vegetable broth, potatoes and bay leaves. Cook until the potatoes are tender. While the potatoes are cooking, measure out the soy milk and add the juice of 1 lemon to the milk. Let it sit for 5-10 minutes until it coagulates a bit. Once the potatoes are cooked, remove the bay leaves, add the mustard and the soy milk mixture and stir. If you have an immersion blender, blend in the pot. If not, transfer the soup to a blender and blend in batches. Be sure there is a way for the steam to escape from the hot liquid or the top can pop off the blender and burn you. Pour the smooth soup into bowls and eat. Toppings: Feel free to add some hemp seeds, chopped scallion or chives, or serve with crusty bread.